Due to its conflicts with labor unions, the word Pinkerton continues to be associated by labor organizers and union members with strikebreaking. Pinkertons diversified from labor spying following revelations publicized by the La Follette Committee hearings in 1937, and the firm's criminal detection work also suffered from the police modernization movement, which saw the rise of the Federal Bureau of Investigation and the bolstering of detective branches and resources of the public police. 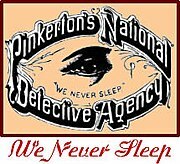 With less of the labor and criminal investigation work on which Pinkertons thrived for decades, the company became increasingly involved in protection services, and in the 1960s, even the word "detective" disappeared from the agency's letterhead. The company now focuses on threat intelligence, risk management, executive protection, and active shooter response. This page is based on the Wikipedia article Pinkerton (detective agency); it is used under the Creative Commons Attribution-ShareAlike 3.0 Unported License (CC-BY-SA). You may redistribute it, verbatim or modified, providing that you comply with the terms of the CC-BY-SA.